You can edit the text by double-clicking within the subcells and typing. You cannot add or delete columns within the subtable. There is a technique to add or delete rows within the subtable using Notepad. Note: You can use this technique to add subtable information to an added row. It can be easier to paste a small subtable into the blank cell from another row, then edit that subtable in Notepad. Select the subtable cell in BizInt Smart Charts and choose Edit | Copy. 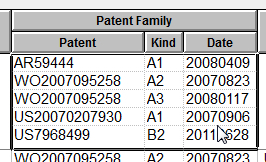 In this example, we will add a Taiwanese patent to the Patent Family subtable. Paste into your Notepad window. Edit the subtable in Notepad as desired, using tabs between columns and return/enter between rows. 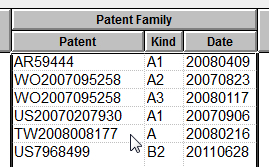 In this example, we used the Enter key after the fourth row to create a new row, typed the TW patent number, and then used Tab to move to the next column. Select the entire subtable and copy. In your BizInt Smart Charts table, select the subtable cell, and choose Edit | Paste. The subtable will be replaced with your edited information.